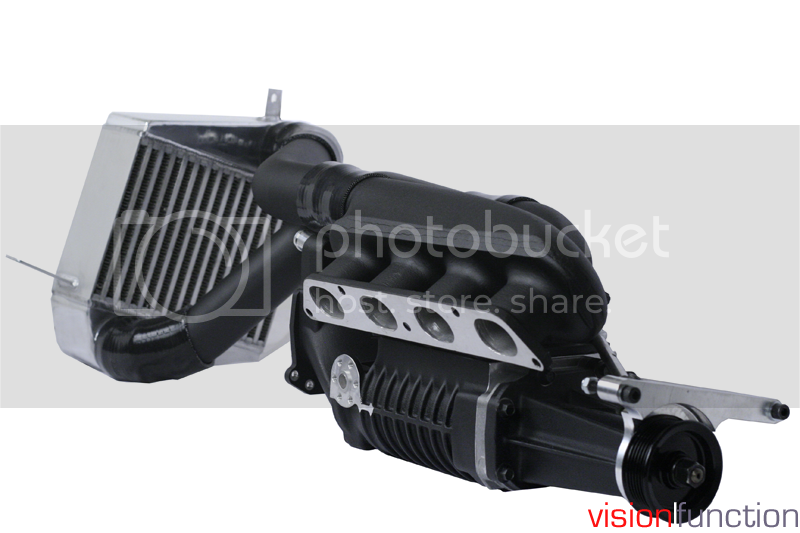 Vision Function would like to Introduce our Elise/Exige Intercooled Supercharger Kit $1100 off MSRP Sale!. 120 hp and 67 ft. lbs over a stock naturally aspirated Elise/Exige. We use the venerable MP62 supercharger. Same unit as GM uses for it's factory Forced Induction Ecotec engines. This model supercharger provides us with exceptional performance in reasonable packaging. Our Stage 2 Kit uses a 30 inch pulley that allows us to make 9.8 psi in the intake manifold. This is more than enough boost pressure to give you an additional 120 horsepower on tap. In order to make the supercharger as efficient as possible we designed a cast supercharger inlet and outlet with SolidWorks and a fluid flow simulation program called CosmosFlowWorks. The outcome was staggering numbers which really show up on the dyno numbers and the road performance of the Supercharger kit. What it doesn‘t tell you is how we do it and how we make this power while maintaining reliability. The secret: Cooler intake temperatures. Cooler intake temperatures mean a denser intake charge and a denser intake charge means a larger mass of air in the combustion chamber at any given boost level. More air means more horsepower (with the proper control of fuel and ignition timing, of course). Cooler intake temps have the added benefit of reducing the risk of engine damaging detonation. The injectors of choice are RC Engineering 550cc Injectors. At our 10 psi we are have complete control of AFR all the way up until our 8500 rpm rev limit. These injectors work well with our kit allowing you to have a very smooth idle quality and superb fuel control throughout the power band. Upon conception of our Supercharger Kit, we sought the best Engine Management Solution and now we have a great working relationship with CharlieX. Together we have spent countless hours of dialing in the Fuel Map, Ignition Map, Variable Cam Timing Map, etc. After long days and some nights of tuning the car really seemed happiest at about 13.0 afr on the small cam, then at peak torque on the large cam 12.5 afr at peak torque and 11.9 afr at Peak Power. While running it slightly richer than usual we did lose some horsepower but what we gained was reliable as a richer AFR gives you better in cylinder cooling. Simply said less heat less stress! We use our in house Dynapack Dynometer, in the load based tuning mode. This is great R&D tool to dial the car in properly with its steady state rpm tuning and load ability. Some of the great names in the automotive industry use this dyno like Nascar, TRD, MINE'S those are just a few to start. 120 hp & 67 ft. lbs over stock! Price: MSRP $6400 Sale PRICE: $5300! ECU Reflash Including in the Price! Limited Time Pricing! Installation also available! Call Email or Bat Signal! This is a sweet deal! How much to do the upgrade from BWR at your location in MD? 92 Isuzu Stylus RS "Handling by Lotus"
I'm still broke, can I leave a deposit? Just sent you email Jermaine...I'd love to upgrade from my BWR to the VF, but my two concerns revolving around the rules of LotusCupUSA are: 1) I have to run stock pulley, and 2) 260 whp limit. I am thinking perhaps running lower boost, but maybe Charlie would have to customize this tune? This is very very tempting....Do you know when your available for the install? Sold my Viggen! Is there any left @ same price? I have a handful of kits left from this batch. Shoot me an email. If you have a stock Exige 240/260, can you just order the conversion kit for $2900? You say this is for Exige/Elise yes? How and where does the intercooler mount on an Elise? Looking at a 2005 Elise application. One of the reasons this A/A Kit works is the intercooler placement which is fed by the side scoop/grill behind the drivers left shoulder! It's really gets some good airflow unlike the stock Exige location sitting directly over the engine. If you are an Exige S owner we offer a S2 Upgrade as well. 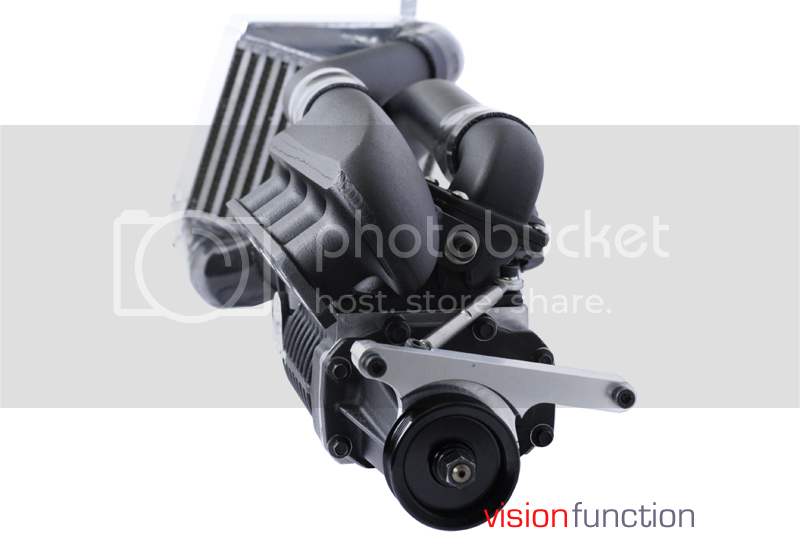 Which does not require the intercooler conversion or casting change. left my deposit today for the next batch of kits. I cant wait! This might be a dumb question but does the katana kit include everything just at the cheaper price? or is that an additional amount to add the katana?